Heavy duty paper shredder with non-stop working motor is an ideal shredder for destroying a large amount of papers in the office or factory, a Made in India shredder with exceptional value for money. Keep shredders at your office so all staff can shred documents before disposal, ensuring that company and client information doesn't fall into the wrong hands anytime. Heavy duty paper shredder makes it easy for employees to destroy documents quickly and anytime as the shredder is always ready for use, making the papers unreadable and safeguarding important information. If your office needs to shred large amounts of documents frequently, then go with this SASCO heavy-duty paper shredder designed to handle multiple pages at once without jamming or stalling. No need to remove staple pins, clips, rubber bands, thread Etc. 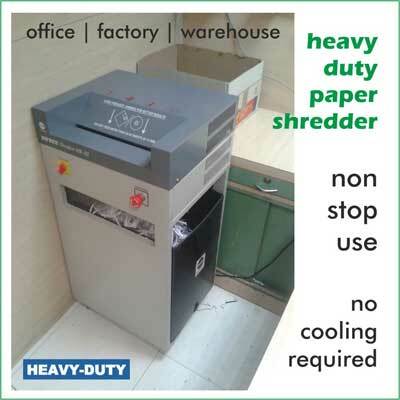 We offer these shredders at very low prices making this scrap paper disposal very economically safe; with numerous models to choose from you can definitely find one that's right for your office. If your company needs to occasionally destroy other items, such as CDs and credit cards, look no further our machine is very capable of doing those items also. Protect private information of your company and client data by having your employees shred ALL documents before throwing them away. It's worth the peace of mind knowing that you are safe now even if someone goes through your company's trash, it's impossible to get anything from the jumbled pieces of small cut papers. An added benefit is you can expect your clients to be impressed with your company's security measures and policies. â€¢ Strip-cut shredders cut paper into thin strips, these machines have simple design cutting heads with least maintenance requirement. â€¢ Cross-cut shredders use cross cut sharp cutters with protruding spokes to cut paper vertically as well as horizontally into small, unreadable pieces. â€¢ Micro-cut shredders make the papers into very tiny pieces; these shredders have very less sheet capacity and should be used only for very critical and sensitive information destruction of documents. At SASCO, we sell a huge variety of shredders, degaussers and other machines for the office, we know how important it is to find high-quality products that you can rely on. We're all busier than ever, and wasting precious time on a malfunctioning machine is enough to ruin anyone's workday schedule. A heavy-duty paper shredding machine is your best bet for avoiding jams and breakdowns without having to painstakingly hand-feed each individual page through the machine one at a time. Even as we move further and further into the digital world, no office can afford to be without a quality paper shredder. Paper is still a big part of our lives, whether we like it or not, and safeguarding privacy is just as important offline as it is in the cloud. Identity theft remains a real growing threat in India, and keeping fraud at bay requires diligence. When it comes to disposing of paper documents, shredders can't be topped anytime soon. 1. Sheet capacity is number of papers together in the shredder at one time with staples and clips etc. 2. All shredders are equipped with heavy duty non-stop motor and hardened steel cutters. 3. All shredders are made in India with after sales network available in remote areas and industrial estates.